Well this sounds promising. Some might even say it is Super. Little by little, details are squeaking out regarding the highly anticipated The Justice League: Part 1. While the film isn’t expected to be released until 2017 comic book fans and moviegoers like have been thirsty for more information regarding DC’s answer to The Avengers. My Entertainment World has recently listed a few details regarding upcoming movies. Looks like we have a potential villain for The Justice League and if the description for the film's story proves accurate, it looks like the big bad is none other than Darkseid himself. The world's greatest heroes are assembled to form the Justice League, to combat a threat beyond each individual's capabilities. The story involves Darkseid planning the destruction of Earth by blasting it with a ray that’ll move Apokolips into the Earth’s place. One of the most insidious and powerful villains in the DC Comic universe, Darkseid is essentially a God. First introduced in 1970, Darkseid is the ruler of the volcano-filled planet of Apokolips. Inspired by Adolf Hitler, he rules the planet with an iron-fisted dictatorship and has the goal of ruling and enslaving the entire galaxy. And with an evil army at his disposal, as well as a myriad of superpowers, he seems like the perfect villain for a team of Superheroes to unite against. News of The Justice League: Part 1 comes after the DC Film team attempted to reboot and form a copasetic series of films, akin to Marvel’s Cinematic Universe. Man of Steel was the start at this journey, premiering in 2013 to successful reviews and box office results. While it’s been a couple years since any DC Movies have been released, the universe has been expanded quite successfully on television. With shows like Arrow and The Flash on the CW, as well as Fox’s Gotham, audiences have been becoming more invested in DC Comic characters. So, it seems a perfect time to bring more characters to the big screen. Our next opportunity to see DC characters in film will be Batman v Superman: Dawn of Justice on March 25th. Starting with the controversial casting of Ben Affleck as Batman, hype has been increasing steadily. Plus, there are Batman v Superman’s subtitle hints at the expansion of the universe and formation of the Justice League. 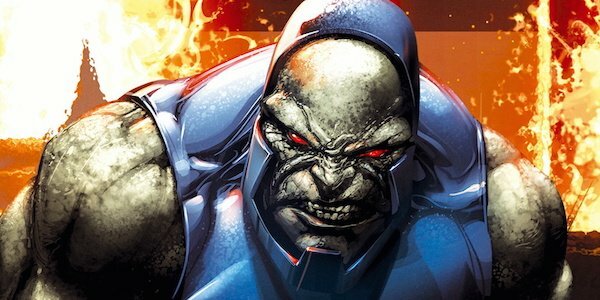 Darkseid seems to be the perfect villain for the upcoming Justice League films. After all, with the strength of the Man of Steel, the villain needs to be big enough to challenge both him, and his squad of heroes. With Darkseid potentially serving as the primary villain, the next big question will be which heroes from the DC Comic Universe are going to be in the team. Batman, Superman, and Wonder Woman will all appear in Batman V Superman, and it has been announced that Justice League will also feature Cyborg and Aquaman (played by Ray Fisher and Jason Momoa respectively) but I’m going to assume that there will be more than just those five on the Justice League. Is there any possibilities that TV’s Flash and Green Arrow will be crossed over onto film? Regardless, the possibility of Darkseid as the main villain makes the stakes high for Justice League. About as high Kal-El can jump. See what I did there?